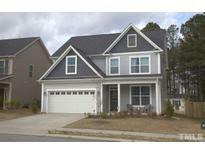 Below you can view all the homes for sale in the Grays Creek subdivision located in Fuquay Varina North Carolina. Listings in Grays Creek are updated daily from data we receive from the Raleigh multiple listing service. To learn more about any of these homes or to receive custom notifications when a new property is listed for sale in Grays Creek, give us a call at 919-213-9465. Flat fenced backyard. N'hood pool & playground. MLS#2248116. 5026. Fenced Yard, Screened Porch, Irrigation, Gas Hook Up for Grill/Fireplace, Generator Hook Up, Shed, Tankless Water Heater, CAT 5e Internet Outlets, Insulated Garage Doors & Shelving PLUS 8 Security Cameras ! Community Offers Pool & Playground. . MLS#2245200. 987. The second floor also includes the possibility of 3 additional bedrooms or 2 & Bonus! MLS#2244037. 1710. 4th bedroom is interchangeable bonus room. Welcome Home! MLS#2239231. 2006. Just a marvelous floorplan with some unique touches! MLS#2235057. 835. You walk into a magnificent 2 story foyer showcasing a very nice looking staircase. MLS#2232247. 835.